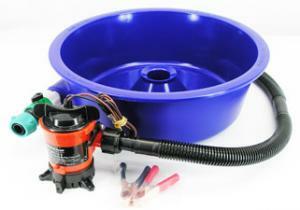 If you would like to use the Blue Bowl Concentrator to operate as a 12 volt recirculating system, buy this Kit that includes a 750 gallon per hour 12 volt pump, three feet of 3/4 inch flex hose, and a pair of battery clips. Instructions included. You will also need a five gallon bucket (not provided). Order your Blue Bowl fine gold recovery kit early as it is a VERY popular product and might have a 1-2 week backorder due to high seasonal demand. Set of 3 Leg Levelers sold separately. Or choose the Deluxe Blue Bowl Concentrator Kit that includes the Leg Levelers and Magic Drops.